This is a very handy little aluminum keychain! 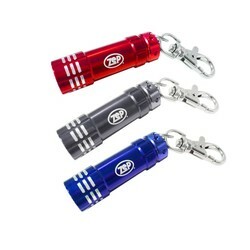 3 bright LED's make for a useful flashlight with a built-in bottle opener and key chain loop. Three LR44 button cell batteries included.Laser engraved in white. 75 1 color(s) imprint at $336 ONLY $4.48 each. 150 1 color(s) imprint at $497 ONLY $3.31 each. 250 1 color(s) imprint at $725 ONLY $2.90 each. 500 1 color(s) imprint at $1,382 ONLY $2.76 each. 1000 1 color(s) imprint at $2,630 ONLY $2.63 each.